Cambridge Islamic Sciences: Are Revolutions The Way Forward For The Muslims? There is no doubt that the Muslims in general are in state of frustration and disappointment at all levels - individual, family, community, national and global levels. And they are desperately looking for a way out of this dilemma. The recent and ongoing revolutions in North Africa and Middle East seems to have provided a tinge of hope, but is this really the way forward for the Muslims? Is this what a Messenger of God would have guided the people to do in this situations or would he have taken a different course of action? 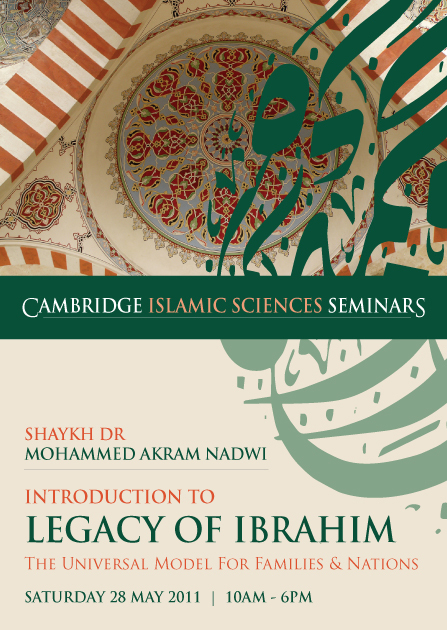 Explore this and many other important questions in the forthcoming amazing seminar by Shaykh Dr Mohammed Akram Nadwi titled Legacy of Ibrahim - The Universal Model for Families & Nations on Saturday 28th May 2011. Prophet Ibrahim was a visionary, leader-par-excellence and a master-nation-builder. He is called a Ummah or "Nation" by himself and a people's leader (Qur'an 16:120, 2:124). His long term vision encompassed the last human on earth. The advent of our own Prophet Muhammad was a result of his dua' (request) to Allah (Qur'an 2:129). So who is better to take as an example than Prophet Ibrahim in building solid and strong individuals, families, communities and nations? So much so that even Prophet Muhammad was instructed to follow the way of Ibrahim and take him as an example (Qur'an 3:95, 60:4). This is your opportunity to immerse yourself in this rich legacy that would help you become a strong individual and also help your family and community stand out as shining examples for others to follow. This is a first-of-its-kind one-off seminar with very limited number of seats due to change of venue. So book your place now to reserve your seat.